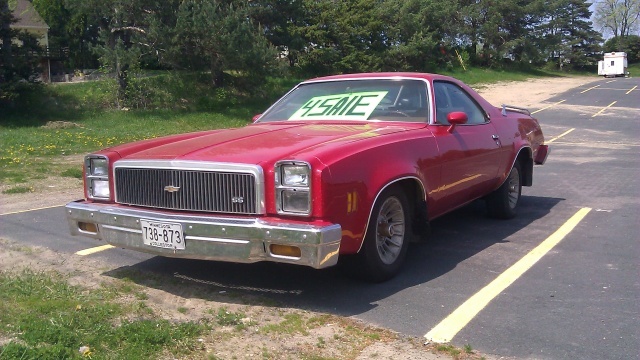 Another one spotted today for sale here in Mpls. metro area. '77 El Camino that looks rust-free. Certainly not a Rust Belt car from looking at the underside. 350-4bbl. Paint is flaking in places. Has Saddle colored swivel bucket interior w/console. 127K miles. Round instrument gauges...but, with idiot lights like on std Monte clusters. Looked clean. He's asking $8K OBO 612-221-8142 (Rick). Nice find ... wish I could afford it ... lol. 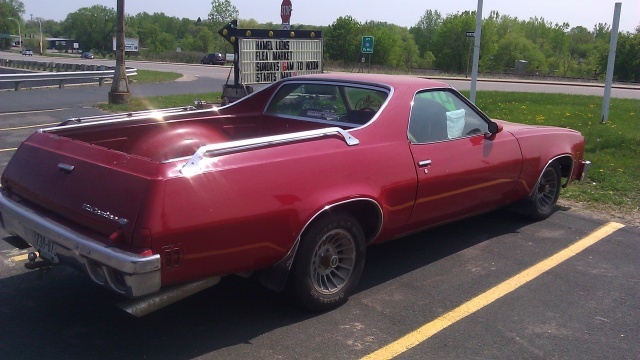 It does look like a nice el camino. It appears that it might be a factory SS, with the grill emblem and without the rocker moldings. It has the long wheel well moldings also. It's a shame that it is missing the top of the tailgate trim. That piece is almost impossible to find not all beat up.